Aso Fenix does not only focus on doing renewable energy projects, but helping with community development. The projects are a way we enter the community, but once we enter the community we stay to help in other areas; i.e. community organization, income generation, sustainable agriculture, gender, health, education, nutrition, sustainable agriculture, education on the environment, watershed protection, reforestation and conflict transformation. We may touch these areas by providing capacitations with adults and children, doing other small projects or in building relationships in the communities. Aso Fenix´s goal is to help improve the livelihood of the people and the projects bringing water or electricity are only a start. We also offer other NGOs and institutions technical assistance in the field of renewable energy sources, education and training of technicians, energy diagnostics and rural electrification. 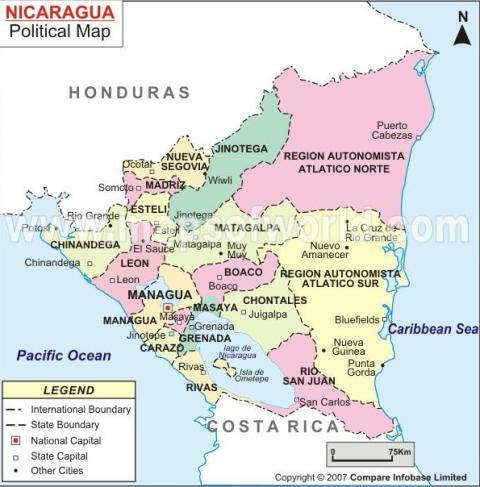 Nicaragua is the largest and lowest Central American country, but is the least populated one (5.5 million).Managuais the capital and largest populated city (140,000) at an elevation of90 meters. Unfortunately, it is also the second poorest country in the western hemisphere afterHaiti. Most of Nicaragua’s population lives on the western side of the country and the eastern part is made up of two autonomous regions, which is mostly uninhabited rainforest except for the few indigenous tribes.Nicaraguais known as the land of lakes and volcanoes, having an abundance of both.Nicaraguahas the oldest colonial city in theAmericasalong with the largest cathedral in all ofCentral America. Unlike many other Central American countries the national sport is baseball. Our office is in Managua, but our work is mainly done in the department (think of it like a state) of Boaco, which is located in the center of Nicaragua. There are two municipalities (kind of like a county) in Boaco, where we work, Teustepe andSan José de los Remates. The communities in the municipality of San José de los Remates are Malacatoya, Corozo, El Roblar and La Laguna. Malacatoya and El Roblar are located in a humid tropical forest with mountains that reach between 800 and1000 meters. People here grow coffee, sugar cane and passion fruit to name a few. La Laguna and Corozo are situated in a drier area, but in the mountains. They have a shorter rainy season then Malacatoya and El Roblar. They grow beans, corn, millet and some fruit trees like oranges. 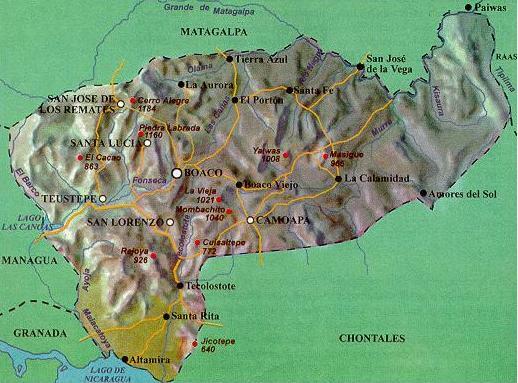 The communities of Candelaria, Son Zapote, Bramadero and Potreritos are in the municipality of Teustepe. These communities are located in a seasonally dry area at an altitude of 200 to500 meters. The locals plant beans, corn and millet during the rainy season. Part of your experience will be working and living with a family in one of these communities, so it would be great if you know some Spanish to enhance your experience. If you don’t know any Spanish we would recommend taking at least a week class when you arrive in Managua, but it is not a requirement. Also, there are three bilingual volunteers that can assist you as you are learning the language and living in the community will also help in your language learning.